Bring your logo to life with Contractor’s Clothing Co.
Contractor’s Clothing is your single source to supply all your decorated apparel needs. We offer end-to-end, in-house logo apparel solutions and carry the most comprehensive collections of high-quality clothing that will help your staff look their best and take pride in their workplace. 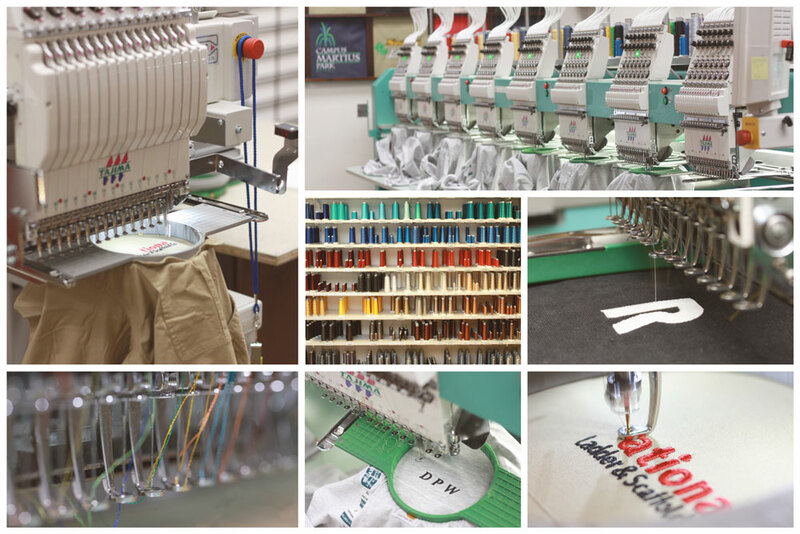 With over 30 years of experience creating customized uniforms for a variety of brands and businesses, Contractor’s Clothing Co. sets the standard for quality embroidery. We offer our customers the very latest in embroidery techniques, threads and appliques to make your logo stand out. We have the most experienced in-house digitizers and embroidery operators, and the production capability to quickly fulfill any size order from 1 piece to 100,000 pieces. Our team is also committed to continuously seeking out garment design and wearer comfort to offer a curated assortment of garments and color options to suit your needs, all while delivering the best possible value. We pride ourselves on our expertise and promise to provide the assistance necessary to help your community create and maintain a professional and approachable appearance. At Contractor’s Clothing, you can easily customize fashionable branded apparel from all your favorite brands including Carhartt, Nike Golf, Levi’s, Port Authority, Port & Company, New Era, Jerzees, Sport Tek, Lacrosse and more! Select the type of garment/apparel material you would like to have embroidered or screen-printed and determine location of logo placement. If you have a specific item in mind, be sure to note the style number and color code.Once you have an idea of what you would like to have customized, you can either contact us over the phone at 1-800-383-1117 or fill out our Custom Embroidery Form listed above. If you cannot find what you are looking for on our web site, our knowledgeable staff can point you in the right direction. We have thousands of styles to choose from.You will be asked to submit your logo or electronic artwork through our custom form or you can send it to info@contractorsclothing.com. Image files that end with .tiff, .jpg, and .eps files work best. Our on-site graphic design team is also able assist in developing custom logos or unique designs for your custom embroidery.We will then use our digitizing computer program to convert your logo into a system of stitches. This will be sent to you for final approval.Once pricing has been determined and the digitized logo has been approved, your credit card will be charged. We then begin the production process of your customized order.Your order is shipped out from Madison Heights, MI. Lead times will depend on destination and shipping method. The Pantone Matching System (PMS) is a standardized color reproduction system used by Contractor’s Clothing to ensure color accuracy and consistency. We often ask customers to provide the PMS colors of their logo so we can match the colors correctly. If the customer is unsure, we work together to determine the closest-matching thread. We stock hundreds of embroidery thread colors year-round, with additional colors available upon request. We also provide flame resistant thread options to add logos to top FR brands such as Ariat and Carhartt. Standard size for a left chest design ranges from 2.5" to 4" wide x 1" to 2" tall. For larger size logos, the sleeve or back yoke is recommended. You can go as large as 5" wide x 3" tall on the sleeve on a larger garment but we recommend 3" wide and no wider than 3.5". The smallest text we can embroider with any accuracy is about .25” tall. We can adjust your logo design to compensate for slight variations. To ensure best presentation, we will discuss and confirm logo placement with you during the acknowledgement process. The embroidery process begins with your company logo,or an idea for a design.That logo, or design idea must first be presented as a piece of artwork. That artwork then must be "digitized," which is the specialized process of converting two-dimensional artwork into stitches or thread. The digitizing computer software will allow numerous machines to embroider (stitch) the logo/design repetitively onto numerous garments. When an image is digitized, our technicians use a specialized digitizing software that assists in accurately converting your logo or electronic artwork into a system of stitches that the embroidery machine can read. This activity is as much an art form as it is a science. Skill and creativity are essential. While the digitizing process automates the machine stitching, much of the process continues to be hands on. Before the sewing can begin, specific thread colors must be loaded by hand into the machines. The machine itself is programmed by our technicians to sew the design in a specificcolor sequence and sewing speed. The garments must then be "hooped" individuallyby hand, and loaded into the machine. Once the design has completed sewing, the garment is taken off the machine, un-hooped, and then sent to the next step in the production process. Your order will be shipped from our store in Madison Heights, MI. Lead times depend on your destination and shipping method. Standard embroidery lead time is 10-15 working days from the months of February to October and 24-30 working days from November to January. Please allow 10 working days for custom screen printing. All sales on embellished goods are final. Embroidered items can be returned if the item is defective. In such cases, Contractor’s Clothing will replace the item at no cost. If you have any problems with products, you must notify us within 7 days of receipt of the order. If you have any questions, or would like to place an order, please contact us using the contact information below to call, email or to locate our store. We are happy to offer our expertise and suggestions.